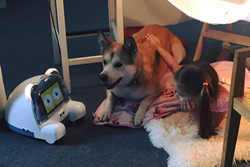 Peddy, an amiable and innovative robot that provides pets with nourishment and care, is now available on Kickstarter. With its various features and friendly design, Peddy, the conjunction of the words “pet” and “buddy”, makes a great companion for all pets. Peddy is perfectly designed for busy owners who cannot consistently be with their pets because of work and other obligations. Many of its features are designed for pets to thrive even in the temporary absence of their owners. The real-time two-way video call function enables communication between pets and theirs owners anytime and anywhere. When pet owners spend the day away from their pets or go on vacations, they typically opt to either leave their pets at home alone or hire petsitters. With Peddy, owners can be assured that their pet is fed, entertained and well-cared for at all times. With the automatic food dispenser, the user’s pet will be fed at a scheduled regimen and with the auto play mode, pets can enjoy the video and photo playback displayed on the screen. Peddy comes with an easy-to-use mobile application and tablet that enable all of its features, such as feeding, monitoring and video-calling. The robot itself is shaped like a small dog and includes a space for the tablet to serve as the display screen. Peddy is equipped with two wheels, which allow it to move on its own at various speeds. With its movement ability, Peddy can take photos from multiple angles in the case of an emergency in the home and can send the pictures directly to the user’s smartphone. Pre-order of Peddy is now available through the product’s Kickstarter page (http://kck.st/2zF6D4Z) , and it is a consumer-ready product with positive reviews. During the campaign, Peddy can be purchased for $279 USD as the Super Early Bird price, $299 USD as the Early Bird price and $319 as the Regular price. When the campaign funding goal is achieved, the company anticipates manufacturing and delivery to be complete in March of 2018. Peddy is a California-based startup developing premium user-friendly products dedicated to enhancing the lives of pets. The products are designed and developed in Newport Beach, California and are manufactured in Seoul, Korea. Peddy was founded by a team of experts and engineers who are committed to producing new IoT technologies for pets and their owners. More information can be found at their website: http://peddylook.com/.